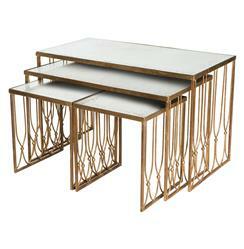 The possibilities are endless with these versatile nesting tables of three different sizes. Scatter them as side tables, use the largest as a coffee table or group them for a graphic display. Antique gold finished iron bases and mirrored tops add Hollywood glamour to any setting.